I was born in a one-story merchant house at Taganka. 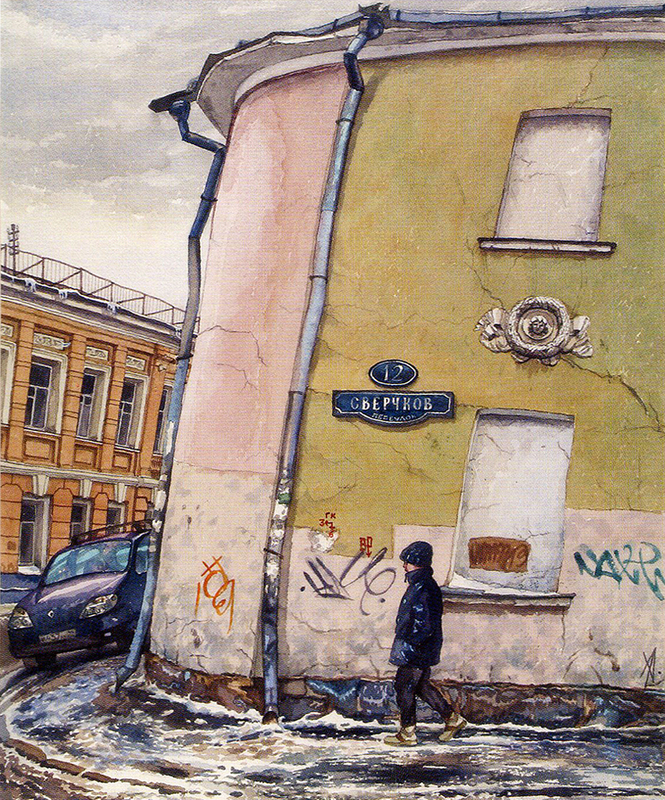 The house stood on the corner of Vorontsov street which still had trams back then, and Mayakovsky alley. The end of that alley was once home of poet Vladimir Mayakovsky. My grandmother told me how she met him on the street many times, with a cane and hat, walking home with a flourish. Streets of cobblestone and asphalt came later. At the corner there is a column with artesian water, which are now found in the provinces and have disappeared from Moscow in the sixties. The courtyard is a classical Moscow type, surrounded by a dense, high fence with a gate still hanging on large hinges, and with gateways on both sides. Two huge, ancient trees, behind whose trunks playing children would hide, are still standing. This is the only thing that survives today from those times. While walking through the old Moscow, my eyes unerringly catch pieces and corners that are not yet affected by the “restructuring”, carrying within them a century of history. Many of my watercolors of Moscow houses are “portraits”, for example: “Sivtsev Vrazhek, 6?, “Crickets Lane”, “Yauza Boulevard.” What is important to me are the details that help to accurately convey what is planned. The watercolor “On the street Solyanka” is a portrait of a piece of an old fence, worldly-wise and living its last few years. Now there are irreversible changes in our environment, that are probably necessary. It is very painful, like the passing of loved ones. Alena Dergiliova for the readers of the ”Russian Art & Paris”. Alena Dergiliova is one of the most prominent Russian graphic artists, that are acutely aware of the “aura” of objects, their primary energy. It catches the eye of viewers, who observe the artwork for long periods of time, filled with hidden power. Outwardly, they are harmonious, but include a lot of dissonance that creates worry. In Soviet times, Dergiliova was breaking free from the strict ranks of “Varnishers” with the reality of being “disheveled” and lack of heroism in her scenes. In the format of what is called “new” art in modern Russia, she is not radical enough, does not wander around the labyrinth of the subconscious and does not create art for the decoration of walls. • Moscow was portrayed by many famous Russian artists. Every age gives rise to new art creators. We know the graphic art of A. Vasnetsov dedicated to recreating the ancient landscape of the city. We remember the canvases of Y. Pimenov, filled with the joy of sensations of the advent of new residential areas, watercolors of V. Alfeevskiy and K. Kupecio. 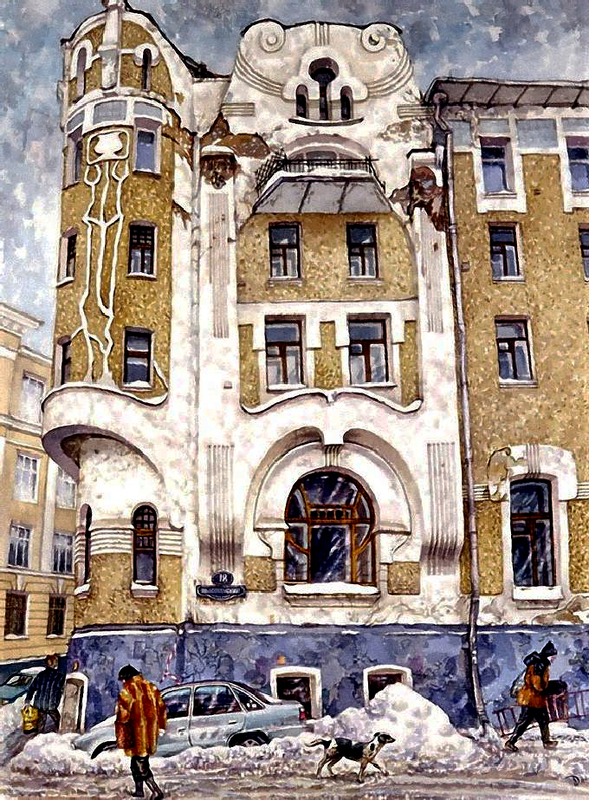 The beauty of the architecture of Moscow is still today trying to be captured by many graphic artists and painters. However, the changes in Moscow in real time are so significant, that they require the deepest possible understanding of what is happening, by means of art. The complexity and tenderness of these changes can only be felt by an artist, not just living in Moscow and worrying about her fate, but also drawing daily the constantly changing face of the beloved city. • Such an artist, with heart tied to Moscow, is Alena Dergiliova. A series of watercolors “My Moscow”, created over the last fifteen years, is the most striking and significant phenomenon in her work. The series consists of 100 watercolors that reflect life in historic districts as well as the characteristic features of modern urban ensembles. Four scenic blocks: “Metropolitan life”, “Old streets”, “Gentry Moscow”, “Stalin’s Moscow” allow the viewer to fully immerse himself in the multi-level world of this city. A distinctive feature of the series is the construction of compositions in the form of a pictorial space in which people, houses, streets and squares of the capital all act as equal characters, creating a feeling of a “live” city. • The watercolors of Dergiliova differ from the scenic and graphic works of other contemporary authors representing Moscow and other capitals of the world, by their complex scenic intertwining. The deliberate and professional use of symbolism of the mundane gives the watercolors credibility and depth. The image-symbol may have the widest meaning and leads viewers to the essence of phenomena by forms of expression that externally are not heroic. The artworks of Alena Dergiliova are not cityscapes with staffage but rather intricately lined paintings with action, unfolding in a particular historical or contemporary urban environment. In order to understand her work it is necessary to move away from internal complacency, and only then will the external ordinariness of the presented action be revealed in the form of a controversial and not always comfortable life. “Palace of Aksakov” Etching. (28 x 21 cm); “Sverchkov Pereulok” Watercolor. (70 x 52 cm). “The graphic art of Alena Dergiliova can certainly be called traditional: etching and watercolor by technique; urban landscape and portrait by genre; and finally, it is traditional by her artistic language, by the honest natural image without the aftertaste of styling, by the concreteness in the transmission of visual impressions. The artist does not hide the avid interest towards that which she represents, to the motive or character, whether it is a living person or a house in any of Moscow’s alleys (which is also lively in it’s own way, spirited and eccentric). This entire house, or more often only a small fragment, some quaint bay window, a massive staircase, an arch above the yard, windows in Sverchkov Lane – all this has some particular feature, everything is familiar, recognizable and often loved. Most often it is that quiet Moscow, where not every house is “a monument of architecture” of some old century. However every house is a surviving page of city life, of its intimate stories. Every house is the keeper of the memory of city and family life”. Honored Artist of the Russian Federation, art critic. Alena Dergiliova was born (1952) and raised in Moscow, in the artists’ family. Graduated from Moscow Textile University in 1975. The artist trained at the creative academic studios of the USSR Academy of Arts, under the guidance of academician Orest Verejskiy. 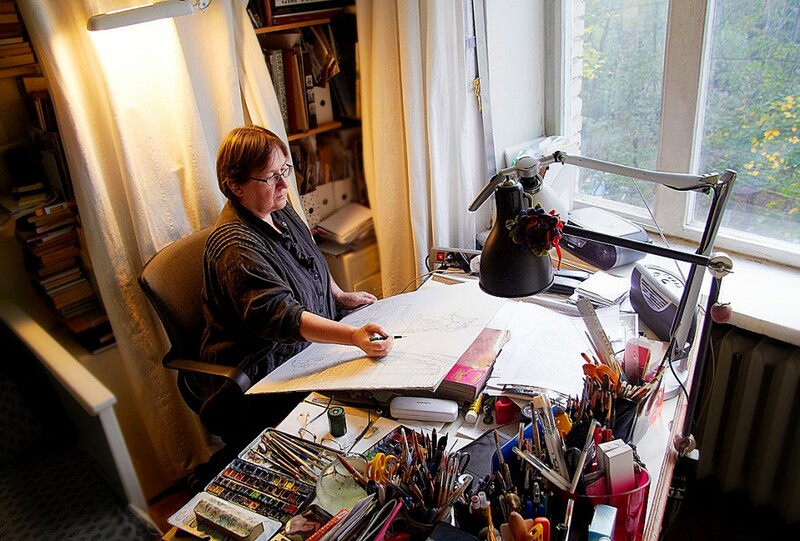 Alena Dergiliova is a member of the Artists’ Union of Russia since 1983. Artist received the Medal of the Russian Academy of Arts in 2007. The works of Alena Dergiliova – etching and watercolor are in the collections of museums: The State Tretyakov Gallery (Moscow), The State Historical Museum, The Museum of History of Moscow, The Leo Tolstoy’s museum.